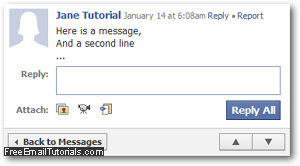 The previous tutorial explained how to send email messages from Facebook; in this tutorial, we will show you how to go around the limitations of the current Facebook Messaging implementation, and actually forward a message to either another Facebook member or friend, or an external email address, whether the recipient email address belongs to a Facebook member or not. 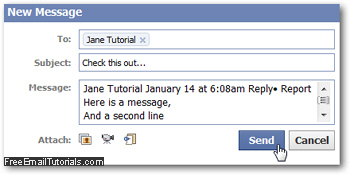 Once the new email message editor has opened, enter the Facebook member user name and/or an email address inside the To text field; optionally type a Subject line, and finally right-click inside the "Message" text box and choose "Paste" from the context menu that opened. To forward the email message, click "Send". The process remains a bit tedious since the functionality is not yet built-in (but Facebook will soon release a new and revamped version of its Facebook Email service, which is still in "invitation-only" mode, which we're waiting to try out). And this is how you can manually forward any Facebook message you have received, either to another Facebook member by typing its name as recipient, or an external email address of your choice (with in mind what we mentioned about sending email messages from Facebook).